One thing that I've been itching to do, is to transform some mix and matched photo frames of mine. A number of them are really standard (boring) frames, but a lot of them have been collected over time--often giveaways from coworkers trying to declutter. This has made a really fun assortment of shapes and sizes, which is to my taste. I had to decide exactly how to go about transforming them in a way that they'd all have something in common when I collage them on the walls. I decided to "distress" my photo frames by using layers of spray paint. Firstly, it is always advisable to head outside for spray painting projects. Lay down some old newspapers, broken cardboard boxes, etc. If the frames are dusty, clean them up. But otherwise, texture and imperfections are good here. Place the frames spread apart. Option one: Apply Vaseline in the areas you will want to expose the original colour. This is what I went for with my wooden frames. Next, apply white spray paint directly and skip the contrasting colour. As you see, I had used painters tape to cover up the inside of one photo frame. This is because there was a beautiful gold colour there that I decided to keep. TIP: I suggest not over-applying the Vaseline because otherwise you won't be able to clean it all up (it's hard to see since it's clear), and the frames will always feel "wet". Option two: Spray on contrasting colour. This is best for plain frames. Wait for the paint to dry as per instructions (I waited at least an hour between coats). 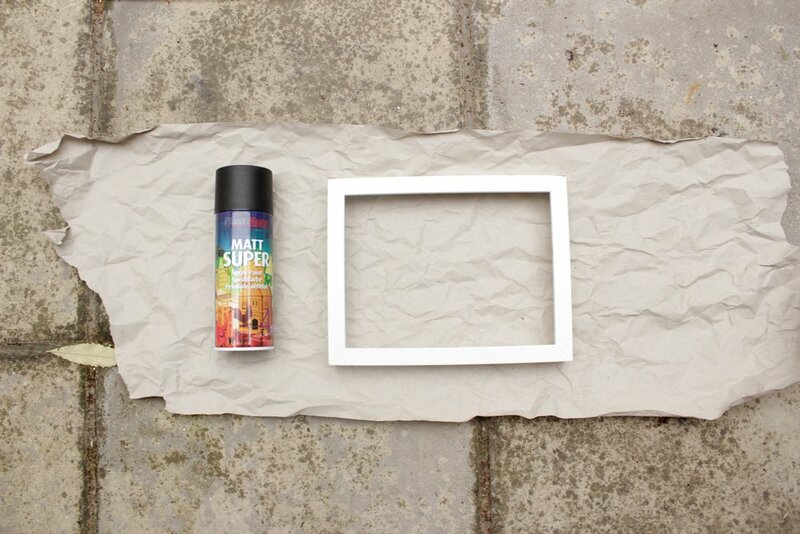 TIP: At first, I just evenly spray painted the whole frames my contrasting colour (black and brown). I later realised that if I have certain spots in mind to distress, I can choose to only spray paint those spots, making the top layer of white easier and save on paint! After you have applied the contrasting colour and it has dried, apply Vaseline and spray paint the frame white as in option one. Once it has all dried: You can go about the fun part, wiping away the Vaseline and thereby "distressing" your frames. I even purposefully scratched the white paint on non-Vaseline areas to make it look more convincing. Viola, your frames are now faux distressed and so modern farmhouse.